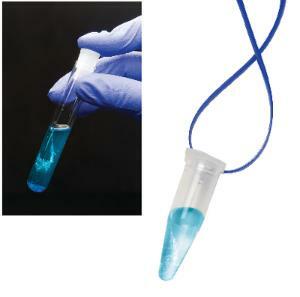 In this lab activity, students precipitate their own DNA from solution and examine its appearance. First, students swab their own cheek cells and add various chemicals to lyse them. Next, they use an alcohol overlay that precipitates the DNA from solution. Finally, students use a safe methylene blue staining of the DNA and transfer it to the DNA Report Card™. Students also create a permanent record of their DNA for safe keeping. Ordering information: This lab includes instructions, a lysis buffer, NaCl solution, a protease, a tris buffer, FlashBlue™ solution, microcentrifuge tubes, sterile, cotton-tipped applicators, transfer pipets, tubes for DNA precipitation, Gene Tubes™, and string. Ice cold ethanol or isopropanol, a water bath, and a test tube rack are needed but not included.